Set the theme! Listen to your friend's songs! Judge their submissions! But watch out, soon it will be someone else's turn to be the Diss Jockey! 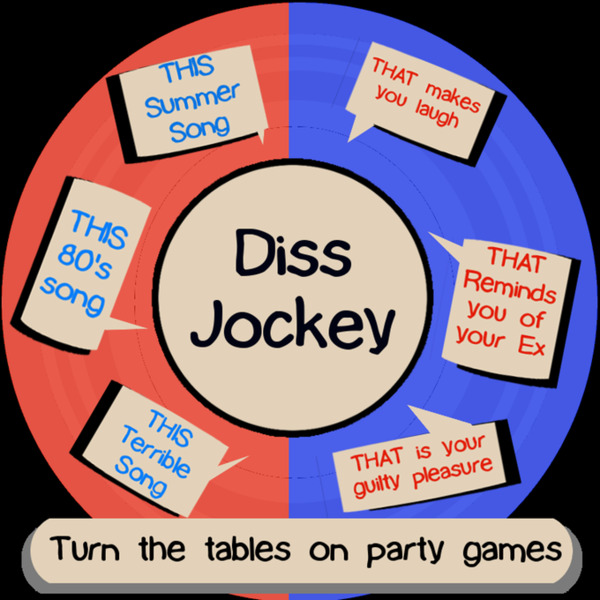 Diss Jockey is a party game where one player sets the theme of the round and the other players submit songs (by playing them on a mobile device) The original player (the Diss Jockey) judges them. 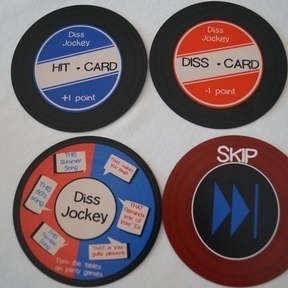 The cards create the theme and then act as scoring devices, as the Diss Jockey rewards the best selection and punishes the worst. The themes are varied, unique, outrageous and hilarious. Diss Jockey was SO incredibly entertaining. As part of a morning radio team, I know it's difficult in this day and age to keep people entertained and engaged with what you are doing. Diss Jockey has somehow captured that, and put it in a box. We had a household full of friends over to play it, and stayed up WAY past my 8:30 bedtime! With so many combinations of categories every time you play, the entertainment factor is always A+, even with different age groups involved. This game is fun for Mom and Dad, their friends, their co-workers, their hairstylist, their mailman, and even the kids (because you get to basically stare at your phone the whole time...what kid doesn't want that?). With snacks and sodas (or something stronger!) It's a great evening of at-home entertainment. A couple of jerks were hanging out and listening to music. Then one of these geniuses had an idea.. What if we challenged each other to play a song based on a certain theme? From that simple idea Diss Jockey was born. Questions or suggestions? Do you want to host a Diss Jockey Party? Let's be friends! Please go like us on Facebook for all the latest updates, and information. You can click on the YouTube link at the bottom for a brief video which covers the rules.